Mind if I get on a soapbox for a moment? Then I’ll hop off and explain this year’s resolution. I promise the soapbox shouldn’t take too long. Humans are hurting Mother Earth. We are stripping her of natural resources and in return giving back garbage, and in many cases uber-toxic garbage that doesn’t just hurt the earth but our bodies as well. The way we live is simply not sustainable, no matter how much we want it to be. Even though I’m getting a little preachy, I promise I’m not getting self-righteous. I’m part of the problem. We all are. BUT…that is empowering because it means we can ALL make a difference by making small changes every day. Okay, soapbox lecture over. This year I’m going to focus on using less plastic, both for the benefit of Mother Earth and our family’s health. This goal was initially inspired by the documentary Bag It. Everyone should see this movie. Look for it on PBS. If you can’t find it on TV, buy a copy. Or save it to your Netflix queue. Whatever you do, be sure to put this documentary on your to-watch list!!! I am going to try to eliminate single-use plastic from our repertoire. Our society treats plastic like it’s disposable. It’s not. It lasts forever AND it requires a lot of resources to be produced in the first place. Start looking around. When you really take notice, it’s astonishing just how reliant we’ve become on plastic and just how cavalier we are about its disposal. Because of this, it’s actually really hard to cut out single-use plastic. I’ll be sure to share our journey as the year progresses! We are going to use more reusable products in general, including containers and coverings for our food (glass and fabric wherever possible), cloth napkins, reusable grocery bags, no plastic baggies in our kids’ lunches, etc. It will be an ongoing process I am sure. When we do use plastic, I am going to try really hard to find plastic that is phthalate- and BPA-free. Trust me. You don’t want that crap getting into your body and every time we come into contact with those chemicals, they are getting into our systems. I’m going to share just one tidbit from Bag It that really got me thinking. The host, Jeb, and his wife had cut plastic out of their lives. He had his BPA and phthalate levels checked then went and stayed at a friend’s apartment for TWO days, using normal, everyday, “safe” consumer products (canned food, microwaveable plastic dishes, lotions, deodorant, kids’ shampoo…all things that claim to be safe, even for babies). After the two days, Jeb had his blood retested. His phthalate levels increased about 11 times and his BPA levels went from undetectable up 110 times. That was after just two days. The good news? It’s reversible. Cut the products with those chemicals from our lives and they will leave our bodies. So, there you have it. That’s my goal. Use less plastic. I hope you’ll join me! good idea, I need to do that as well. My resolution is in the same vein. To actually use my re-useable bags when grocery shopping. I bought them a LONG time ago and keep not using them. I’ve had 2 grocery trips so far and have stuck to my resolution. Hooray me. I’m the same way – have TONS of those bags, always forget them, even when they are in the car! I’m with you…gonna make sure I use those bags! I have a lot of work to do. I always forget my reusable grocery bags and my reusable container cabinet is in need of a makeover. After making over the cabinet I’d then have to tutor the other members of my family on how to put away the containers so they don’t end up unorganized and pushed all the way to the back where no one can reach them. I guess if we’re talking about saving the planet I could put in a little effort. that’s totally the key…I find when I’m NOT doing these things, it’s simply because I’m not putting in the effort. just takes a little extra thought and action…we’ll see how good we can get at that! I’ve been trying this for awhile and it is hard…I miss my plastic wrap and keeping track of lids with matching containers can be a headache. My daughter takes her lunch in a product called Lunchskins. They can go in the dishwasher and she loves the bright colors. The preschool my kids have gone to has a zero waste lunch policy which has totally helped get me in the habit of using cloth napkins and containers. I have really nice, huge, canvas grocery bags I switched to using as a resolution last year. It makes taking our groceries from the car to the house soooooo much easier! Instead of 25 plastic bags per week, I have 4 big, sturdy, reusuable bags. Easy to carry. I also switched to storing all food in glass containers after reading “Slow Death by Rubber Duck: The Secret Danger of Every Day Things”. I like how glass containers can go from freezer to oven or microwave and then into the dishwasher. Much better than plastic. Two things I learned: Containers with the snap on type of lids work best….never any leaks….even when my husband takes soup to work in them. The other lesson is about the bags. I’m a germophobe and read that reusable bags have been tested and found to contain lots of germs…especially e coli. So, now I make sure the bags are washed regularly. I’ll join you as much as I can with reducing plastic in 2012! 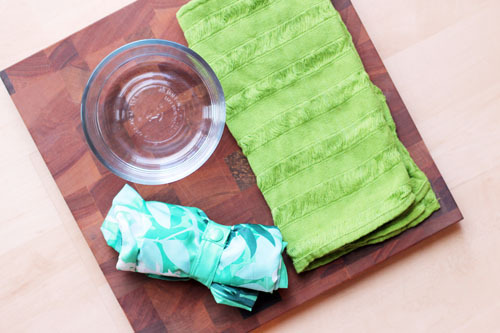 I really like the idea of cloth napkins….an elegant twist to the every day meal AND is good for the environment! Win-Win! great tips! and I will remember to wash my bags…honestly, hadn’t thought of that, but now that I have, I can totally see how gross they could get! I’ll have to check out “Slow Death by Rubber Duck” – in Bag It they talk about how phthalates make plastic maleable…and my first thought was “kids toys!” – scary. what brand of glass containers do you use? just curious as I start looking around. I have a whole bunch of brands. My favorites are Glasslock and Kinetic. Also have a set of porcelin containers with snap-on, BPA free lids that I like. The brand is “Denmark”. I use the old-fashioned glass refrigerator storage containers with the glass lids too (from the 1930’s & 1940’s). I use glass pitchers for iced tea, lemonade, etc. I used to use lots of plastic, but “Death by Rubber Duck” scared the bejeebies out of me! thanks for the tips! I think I need to do a post where people share their favorite products related to this topic…would be super helpful, love your comment! Great resolution! Down south i Santa Monica, it is against the law for grocery stores (and retail) to use plastic bags and if you require a bag (paper), they have to charge you. they talk about these kinds of laws at the beginning of Bag It – it’s amazing how effective they are! I kind of hope this becomes a trend everywhere…sadly the only way to get people to change a lot of times is through their wallets! I’ve been trying to make small steps towards using less disposable plastic this last year but my biggest hurdle is kids’ lunches. My two high schoolers have a 20 minutes lunch and do not return to their locker until the end of the day so everything in their lunches has to be disposable. Because of the short amount of time allotted for lunch neither one of them will even consider buying lunch (and my son also refuses because they are only allowed to buy ONE lunch at a time so he would starve…). So what in the world can I do about the jillion sandwich size ziploc bags we use? They are already carrying around a ridiculous pile of heavy books all day. They cannot handle carrying around non-diposable lunch packing items. Argh. I guess I try to make up for it by being more careful in the home and of course the younger two kids use containters and such. A conundrum. THAT is so annoying. and it opens up a whole other issue…kids do not have enough time to eat at school – it is RIDICULOUS. school lunches…we could go on for days on the troubles with them. I’m going to try to track down some pouches and things that are dishwasher safe for my kids lunches, that replace bags…maybe those could stuff in their bags after they eat without adding bulk or weight? regardless, that is a frustrating situation! Ah yes, another issue…they are not allowed to carry backpacks. They can arrive in school with a backpack but it must stay stowed in the locker until dismissal. They have to carry their books/papers/supplies loose in their arms. So many rules to avoid hidden weapons… I guess I shouldn’t get started on rules in modern high schools! Try these instead of plastic wrap they are amazing!! SO cool! THANK YOU for that link! every little bit DOES count. and love that you don’t use paper either…I’m gonna get there! My mother-in-law gave me a reusable grocery bag from Blue Avocado for Christmas. Love it – cause its so cute!!! And it has a reusable produce bag in it (so smart – never thought of that). And they sell reusable ziplock baggies. Love your goal!!! This is great. Inspiring. I find baggies alone to be very difficult to do without. I always go back. I’m excited to learn more and try to make some changes in our household too. This too is one of my goals this year. I’m having a hard time finding worthy glass food storage. It seems all of the ones currently available have some flaw – leaking, difficult lids, etc. I’m bound and determined to find a good one…obviously will keep you posted of my progress! I am so excited to read this! I agree, the small plastic baggies for lunch and snacks are the hardest. Hoping to find some suggestions for DW safe replacements! Thanks, I love your blog! thanks, nichole! and I’m hoping I can find some good suggestions over the coming year – that’s my goal! We are not doing enough to save our Mother the Earth. The plastic bag is a great offender to our less than healthy planet, however I think we need to do more. My plan, being executed through KYFME, includes a sure way to decrease the unsustainable load we are placing on our Mother. I suggest that for every plastic bag we don’t use that we encourage someone to commit suicide for the good of our Mother. Think how, after many years, the earth will be finally restored to it’s pristine condition before being polluted by humans. Please join me at KYFME–Kill Yourself For Mother Earth, in restoring our planet to it’s true grandeur and pristine condition. Lands End carried some “market tote” bags last year that are strong canvas bags that hold an amazing amount of groceries. Of all my reusable bags, these are my favorites, but they seem to be sold out. Costco sells a pack of reusable bags that are also very good, but they are so good that we end up using them to store/tote stuff like beach gear rather than groceries. I use Land’s End canvas tote bags as my grocery bags and I can’t begin to tell people how many cashiers/packers compliment me on them. They seem to enjoy packing them vs smaller reusable bags. I keep a rolled up Envirosax in my purse to use at other stores for smaller purchases. That’s great Jane! I was just thinking about all the awful plastic we use the other day and how it just piles up. I’ve really been wanting to try more fabric and glass options as well. I’m excited to see how things go for you and maybe steal a few ideas! Great post Jane, I am sure it will make more people think of the impact we have on the environment. I have been using reusable bag when I shop and do wash them. I can’t wait to here more about how you implement this goal–I’ve been thinking about it a lot the last couple weeks. We’ve tried to reduce our plastic use a lot the last couple years, but I’m curious how to get around the way so much produce is packaged. Other than buying exclusively from farmer’s markets and CSA (which we don’t have a good selection year round), I get a lot of produce from TJ’s and they put EVERYTHING in those shrinkwrapped packages. Drives me a little crazy. . .
I’ve been thinking about this, too. But, rather than change too many things on my family at once, I went after decreasing our processed food consumptionthis year. BUT, my husband sai dhe wanted to look for some containers for him to take his sandwiches in so we didn’t use so many plastic bags. My jaw hit the floor!! I’ve been looking on Pinterst for some cloth sandwich bags, but yes! I am dying to hear what prodcuts everyone is uses/loves!! My goal this year is to do away with all rubbermaid and tupperware and get all lock-n-lock in glass. I have purchased several pieces already and plan to add to my collection as money allows. For sandwiches, try a “wrap-n-mat” wrap. My kids love these! They are colorful, reusable, have a liner that can be wiped clean, velcro closure, and when you open them, they are a placemat. I am so happy that we no longer rely on those plastic baggies for sandwiches. Ok, so here’s the one that stumps me: Trash can liners. I do use plastic grocery bags from time to time because they are what I use as liners for my trash cans (rather than buying more plastic bags). that is a stumper! I am going to do some research…good one!!! there are a few biodegradable trash bags on the market. can’t remember names but i’m sure you could find them after a bit of googling.